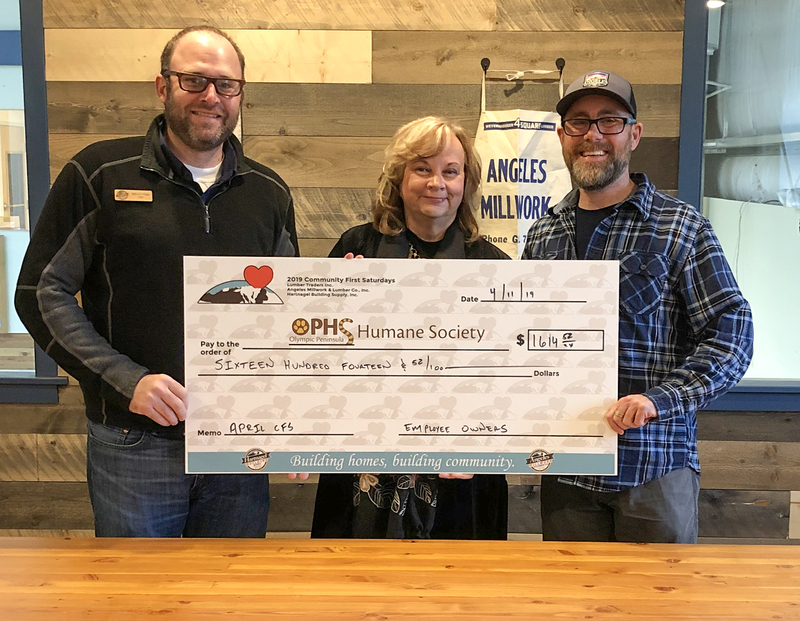 The Employee Owners of Angeles Millwork & Hartnagels with the Olympic Peninsula Humane Society (OPHS) would like to express their appreciation to all our selfless customers! We are grateful for everyone that shopped with us this past Saturday. Your involvement is what makes Community First Saturdays (CFS) such a huge success. 5% of the retail sales from Saturday, April 6th was donated to OPHS along with over $600 in donated cash from our customers! If you haven’t experienced shopping with a purpose, try it! Join us for our next CFS, Saturday, May 4th as we raise funds to benefit the construction of the Gold Star Families Memorial Monument (GSFMM) in Forks. Representatives will be at our stores, asking for your support so Gold Star families and the public will have a tangible place to connect with loved ones and military personnel who died while serving our country. 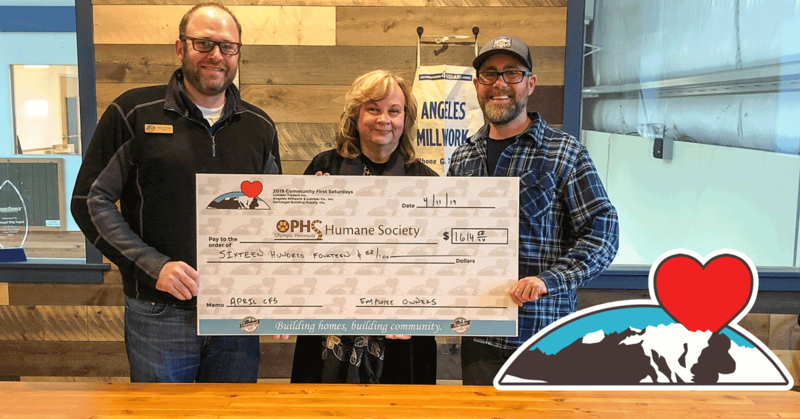 CEO Kelly Fox and Advertising Coordinator Josh Bergesen present OPHS Executive Director Luanne Hinkle with funds totaling over $1600 from our April Community First Saturday. Follow our blog by entering your email in the top right hand corner of our website or follow us on Facebook and we’ll keep you updated! If you’d like to make another effort at assisting the Olympic Peninsula Humane Society and CFS, use the links below! LEARN. Go directly to the OPHS website by clicking HERE. DONATE. Click HERE to donate directly to OPHS! VOLUNTEER. Most non-profits are desperate for your talent and nothing feels better than doing something for another. Learn more about volunteering with OPHS by clicking HERE! SHARE. Like our Facebook page HERE and share our CFS posts with your friends. Also, like the OPHS Facebook page HERE too! The more awareness we can raise, the more we support our community of givers! SUPPORT. It’s not just our stores that give to local non-profits. Many others on the Olympic Peninsula do as well. Make a point to show your support by shopping locally with like-minded businesses that give back to our community.